The Brantford Food Bank offers an Emergency Food Bank Service to individuals and families in Brantford, Brant County and Six Nations. This includes low-income families, children, the elderly, abuse survivors and the homeless. We also provide a Food Distribution Service to 26 other food and meal providers in our community. We believe that every person should have nutritious food and balanced meals. We operate solely on donations and grants. Your generosity enables us to provide food to over 1,200 households who turn to our organization each month, as well as additional people who use other local food programs that we support. When we pass on a simple box of food, we are privileged to witness the gratitude and hope in the eyes of the people we help. Because of you, a single parent can feed their children tonight, a senior has food in their cupboard for breakfast tomorrow, and a youth living on the street has nutritious food in their stomach. Thank you for supporting our commitment to our community and the people in it. It is because of you, that we can continue to provide, not only food, but hope and support to our neighbours through difficult times. The Brantford Food Bank is open to serve Monday through Friday from 1:00pm – 3:45pm. Please remember to bring your ID, as well as ID for each person in your household who requires food. For more information about acceptable forms of identification, please click here. You will also need to bring your own shopping bags to take home your groceries. 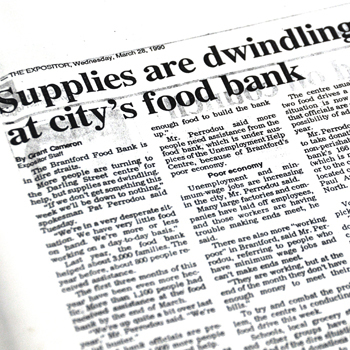 The Brantford Food Bank is open for monetary donations Monday through Friday from 8:30am – 4:30pm. The Food Bank is open for food donation drop-off Monday through Friday 8:30am – 11:45am and 12:45pm – 4:30pm. Please note that we can accept fresh and frozen food at our distribution location during regular drop-off hours. All funds raised in our community stay in our community. For more information on the Brantford Food Bank and our services please contact us. We support many other agencies in our community. Clients from Nova Vita, the Sexual Assault Centre, and others, are supported through our Start-Up Kit Referral program. If you have a client who requires a start-up kit please contact us, and fax or e-mail your referral letter.